In the surveillance video, you can see a group of guys fighting around a Nissan Altima parked against the curb. According to Tampa’s Fox 13, the driver was involved in the fight and trying to leave, but failed to complete the U-Turn in the narrow street. 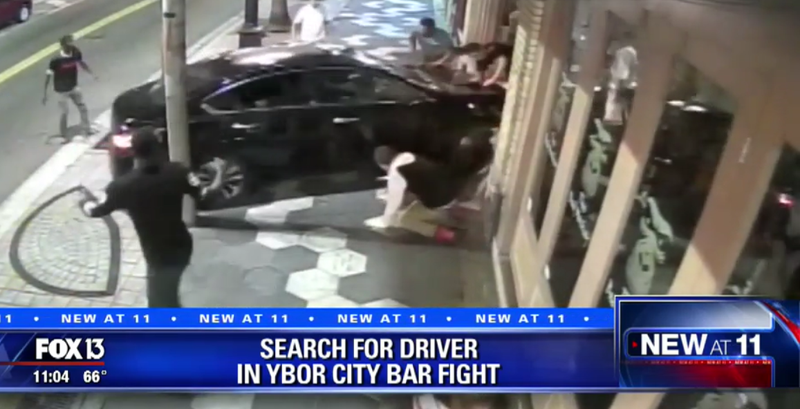 It’s unknown whether the driver was trying to drive into the brawling group, or was mistaken that the car wasn’t in reverse when he punched the throttle and drove one fighter straight through the front windows of Bad Monkey Bar. After the incident, the driver fled the scene. The man who was driven into the bar suffered a minor leg and head injury, and the bar was stuck with $15,000 in damages. If you have any information about the Florida Man who the hit and run driver is, please contact Tampa police. Intentional or not, you can’t just run over a couple of guys. Not even in Florida.